Well, I'm really looking forward to being at this event next week. Though, now the weather's turning a bit chilly, I'm wondering "what was I thinking". However, we may be lucky and we may get the sun. I'll be bringing a selection of jewellery, my bottole top magnets, my Little Craft Box Company Craft Kits, my hanging hearts and the Make Your Own Personalised Bracelets. I've just got a stash of number beads too, so that you can make a bracelet with your mobile number for your child's wrist in case (heaven forbid) they get lost. 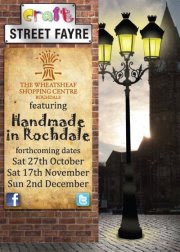 A new, hopefully regular craft event in Rochdale in the Wheatsheaf Shopping Centre in Rochdale featuring the best of Handmade in Rochdale. I'll be there with my Beads From The Art, my new hanging hearts, knitting needles & Make Your Own alphabet wristbands and a few of The Little Craft Box Company bits and bobs too. 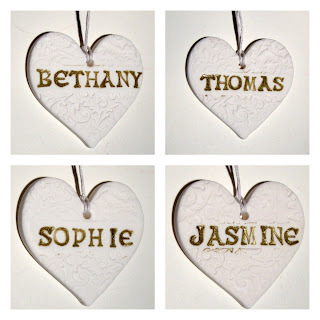 Made from white polymer clay, these pure and simple hanging hearts have been embossed with a filigree design and will be stamped in gold with a name or word of your choice up to 7 letters. The design is on one side and the back is blank. They hang from cotton cord. 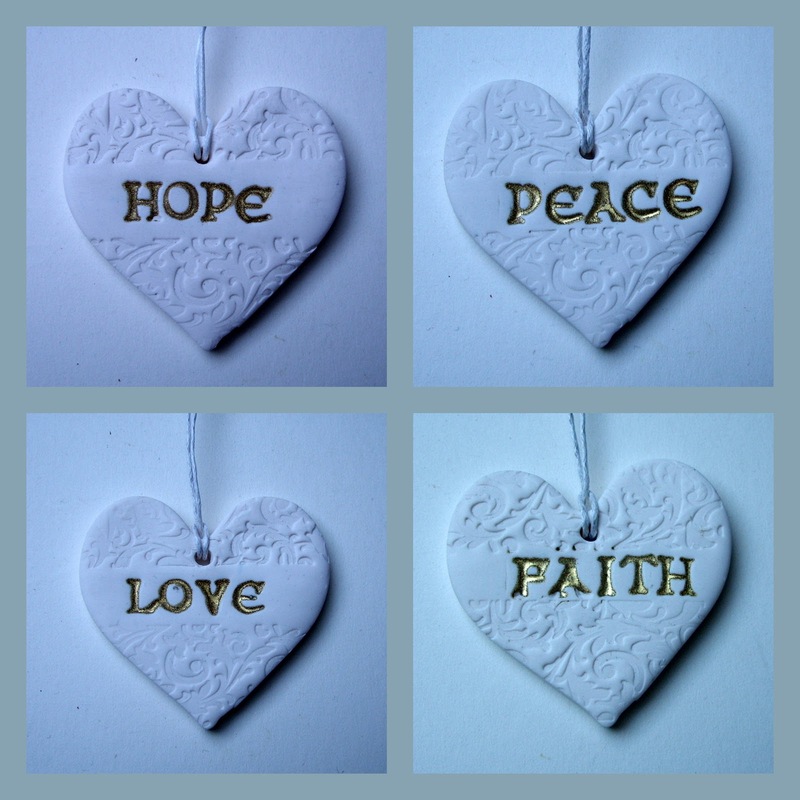 Hang them in your home, from your car mirror, your bag, your Christmas tree, as a momento of a wedding, christening or other anniversary. They would make a lovely gift or just treat yourself to a little something. 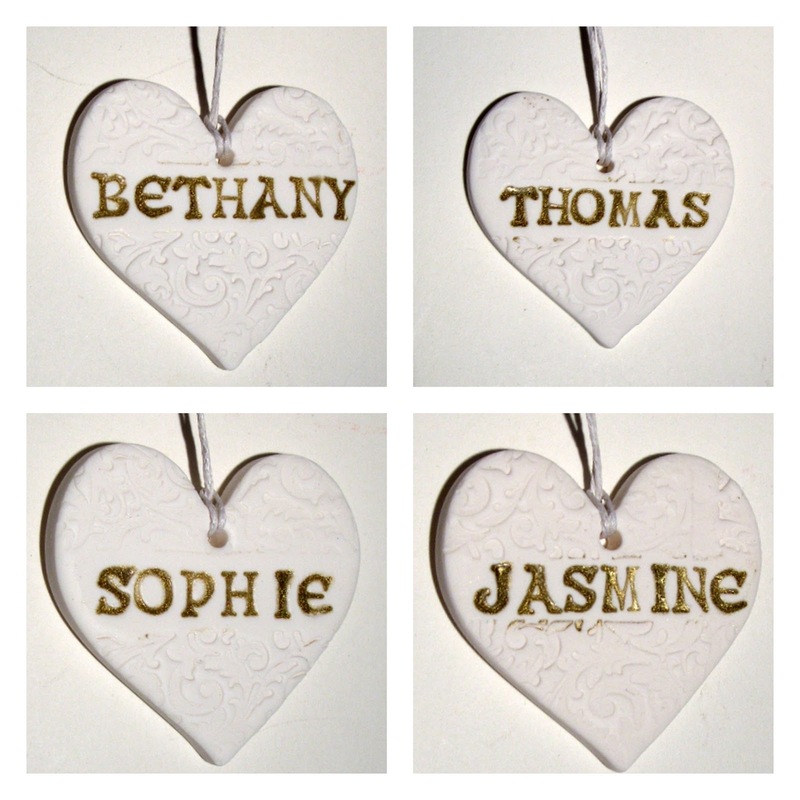 Made from white polymer clay, these pure and simple hanging hearts have been embossed with a filigree design and have been stamped in gold with a variety of inspirational words. The design is on one side and the back is blank. They hang from cotton cord. Introducing the new Vampire's Kiss range. Inspired by all things Gothic and too many trips to Whitby...not to mention those gorgeous costumes in The Vampire Diaries with just a touch of the Helena Bonham Carter's. These necklaces are now all listed in my Etsy Shop and at my Events. 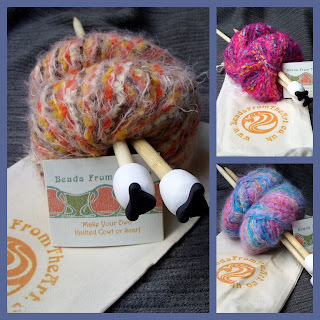 Knitting Kits from Beads From The Art. Each kit comes with a pair of 10mm hand-finished bamboo *knitting needles from Beads From The Art, 2 balls of wool (in shades of pink/blue, cerise/purple, brown/orange) and instructions to make either a scarf or a cowl. Everything fits inside a cotton bag which has been printed with the Beads From The Art bead round logo. They would make fantastic gifts and are on sale at just £14.99. *Other knitting needles are available, such as floral, little pig, or other patterns. My new Falling Leaves collection. 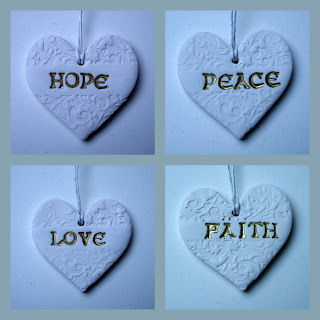 From bottom left (clockwise) Winter, Autumn & a special Christmas one. 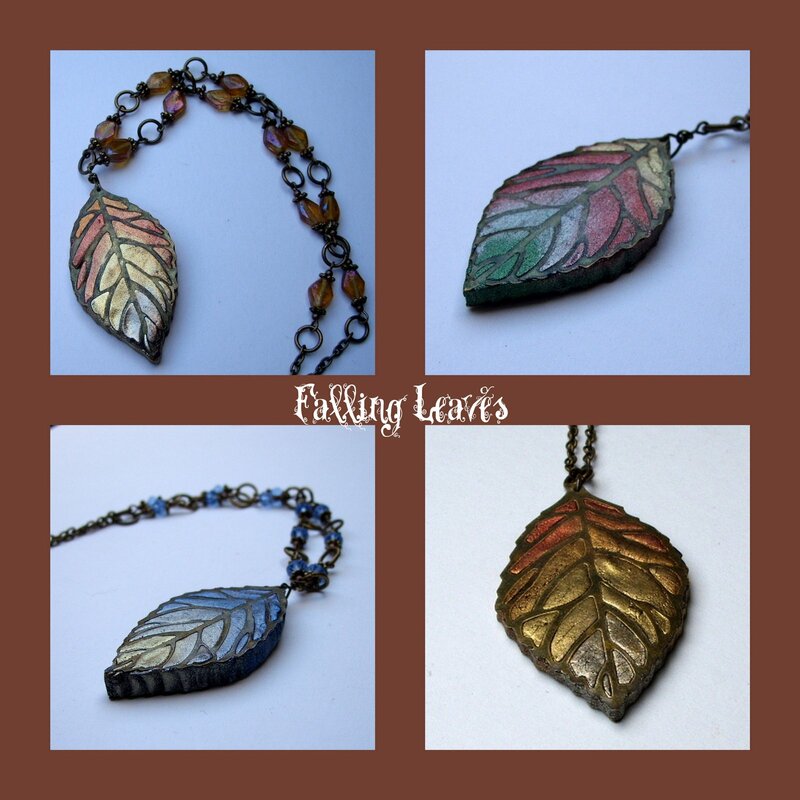 The pendant in the bottom right is my old style Autumn pendant. 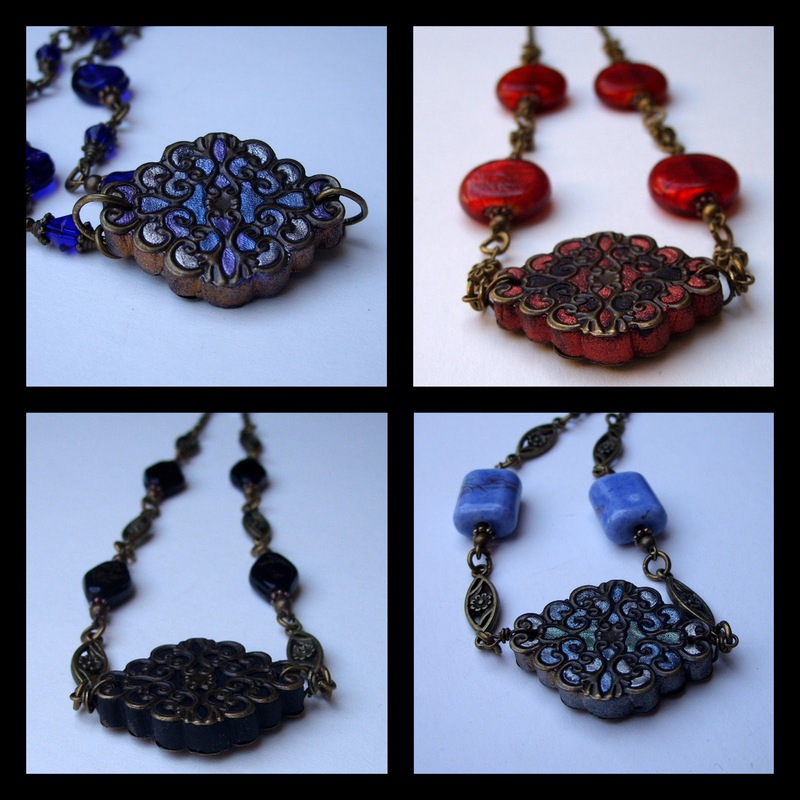 Which is slightly thinner than the new pendants and hangs from a plain bronze chain. The new pendants hang from a necklace of glass beads and brass rings. Sorry, the New Autumn Pendant has now been sold. I'll be listing a similar one soon.